Follow thawing instructions on phyllo dough package. Grease a 9 x 13 baking dish. Finely chop the pecans and pistachios separately. (I use a blender to chop but you can also place nuts in plastic bag and chop with a rolling pin). Set aside some of the chopped pistachios to garnish. Place nuts, cinnamon, ground cloves, and sugar (1/4 cup) in a medium bowl. Unroll one roll of phyllo dough. Cover with a damp paper towel to prevent from drying out. Place 1 sheet of phyllo in the baking dish. 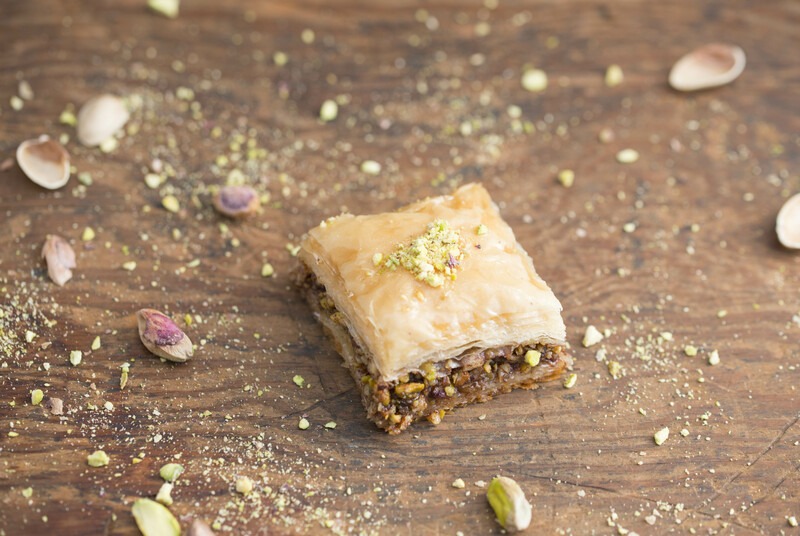 Repeat this process with the whole roll, making sure to cover phyllo sheets that are set aside. Layer with the chopped nuts. Unroll second roll of phyllo, again cover with damp towel. Butter one sheet of phyllo and place butter side down on the chopped nuts. Butter the top of the sheet. Place another sheet, butter, repeat this process with the rest of the sheets making sure to butter the top layer. Meanwhile, make the syrup by combining all ingredients in a medium saucepan. Bring to a boil, then let simmer for 30 minutes. 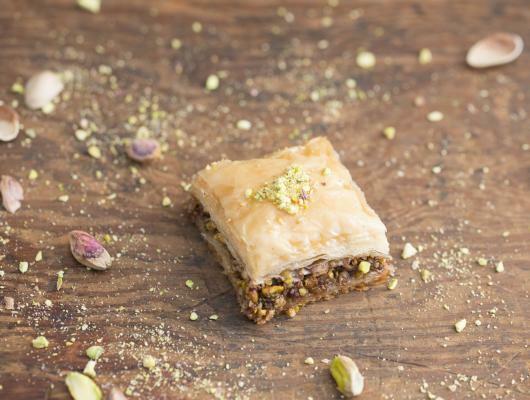 As soon as the baklava is done baking, pour the syrup on top. Let sit for 30 minutes.